Adding V-Guides to the bottom of a conveyor belt helps the belt track properly. Megadyne offers V-Guides in square, rectangular and trapezoidal shapes. 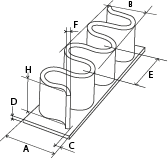 While a single guide applied to the center of the belt is the most popular method of installation, different layouts and multiple designs are required for many applications. Our converyor specialists can assist in designing the best solution for any application. Are you interested in V-Guides?